Want to show your work at the premier showcase for international contemporary art? 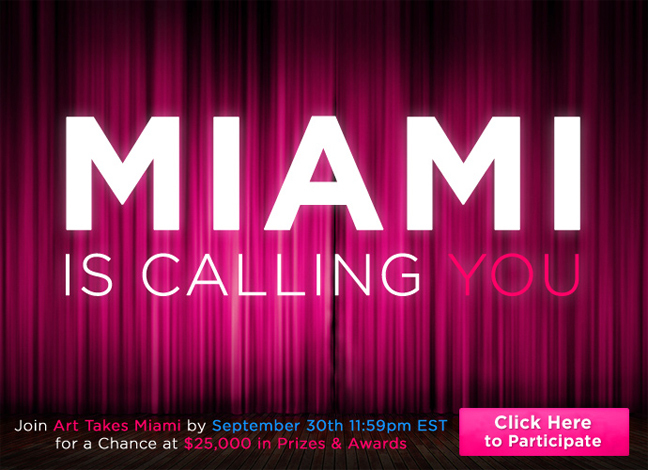 This is your opportunity to earn over $25,000 in awards and exposure, including your own exclusive feature exhibition at the 2011 Miami edition of SCOPE, the largest and most global art fair in the world. Late entries accepted until October 14th; late fees may apply. SCOPE art sales have reached a total of nearly $150 million with more than 350,000 attendees, and Art Takes Miami is your chance to have a piece of it. This worldwide search for artistic talent, skill and vision is your opportunity to position yourself alongside an impressive line-up of A-list galleries and artists, blue chip institutional groups and widely respected international patrons and art collectors.